Every year I put together this thing called an NYE party guide for Ottawa-Gatineau. New Year’s Eve is just around the corner, and chances are you still don’t know what you’re doing to ring in 2018. If you’re attending a house party, you’re set (it’s usually the less-complicated option), but if you’re looking to go out to celebrate, take a look at this list which should help you pick the best event for you. Whatever you end up doing, Eventful Capital wishes you plenty of good times in good company. Enjoy the celebrations and be sure to make necessary arrangements to get home safely. Cheers! An NYE party before NYE is good for those who like to go out but want to avoid the crazy crowds on December 31. Kudos to the Petit Chicago in the Hull sector of Gatineau for putting on a free show on Saturday, December 30 that’ll feature a live set by rock band The Sociables. Nimidiwin promises a showcase of Indigenous culture highlighting the many unique communities of Turtle Island in a brilliant New Years Eve event happening at the Canadian Museum of History. The show is free and offers a family-friendly way to welcome the New Year in peace and friendship. Celebrating on a tight budget? Parliament Hill is offering action-packed outdoor festivities to close-off 2017. There will be programming all day, and in the evening you can catch DJ Shub, formerly of A Tribe Called Red, as well as DJs Carl and Evana Müren. After that, Toronto hip hop artist Kardinal Offishall will rock the mic. and a pyrotechnics and laser show will take place at 9:15 p.m.,10:15 p.m. and midnight. Bundle up! On the Gatineau side, you can celebrate the arrival of the new year at SHAKER. They’re offering wine and champagne at cost until midnight. There will also be a DJ, red carpet and photographer, as well as a mixologist service at your table and hors d’oeuvres. Bar Robo is throwing a big party on New Year’s Eve to wave goodbye to 2017 and ring in 2018 with some good vibes courtesy DJ del Pilar who will kick off the night with some sweet disco and funk jams, and count down the last moments of 2017 with you as the night heats up. DJ SeiiizMikk will take over just after midnight and keep the party bumping with some sweet hip hop and R&B grooves until late. One of Ottawa’s best NYE countdowns is once again happening at the Ottawa Marriott Hotel. Back by popular demand, DJ RayRay will be in the building alongside DJ Mace to get the 600+ party-goers dancing the night away and there will be a photo booth, party favours, hors d’oeuvres, a silent auction and a chance to win a bunch of prizes. New Swears Eve is taking over the 27 Club on December 31st with a live jazz band, mystery loot bags for the first 50 people in, hors-d’oeuvres, complete with a live performance and DJ set by Ottawa garage punks New Swears. Formal dress is encouraged for this one. An all-you-can-eat mac n’cheese party anyone? That’s what the Minotaure has up its sleeve to ring in 2018. Start the night stuffing your face, then dance the carbs away with DJ Cheese Bacon and enjoy complimentary bubbly at midnight. House of Targ is having a Planet Boogie NYE Free-Play Party. You’re invited to board the Targ mothership on your way to 2018 as DJ Commander Kjmaxx and his dedicated disco/boogie crew warp you to the good times. Get your space passport at the door and experience the rush of space travel in Targ’s patented space flight simulator (!?) Bonus points to those who show up in sweet space costumes. Ottawa soul pop group Harea Band will be dropping some big beats at the Rainbow Bistro for New Year’s Eve. If you want to groove on the dance floor to ring in 2018, don’t miss this show, which will also feature r&b/soul/pop artist Grace Marr. DJs Selekta Shellz, Professor Melé and EZ will be playing all the best in Hiphop, r&b, dancehall, trap, old school and everything in between to set off 2018 and keep you moving in the process. The party, going down at the Brig Pub, will include hors d’oeuvres all night long courtesy of Aunt Thelma’s as well as a complimentary glass of champagne at midnight. If you’re into underground house, tech-house, and techno, Mercury Lounge is the place to be on December 31st. It promises to be an all night dance affair from 10 p.m. to 7 a.m. (!) with DJs Balu, Trevor Walker, Rick Laplante, Return of the Jaded and more. Every Sunday for the past three years, A Choired Taste has been bringing people together to celebrate in drink and song. For the very first time, the festivities will be happening at Babylon for an extra special NYE event at which you can expect a wide array of music from Rihanna and The Rolling Stones to Migos and Madonna with a hint of John Denver and a sprinkle of Disney classics. One of the most affordable NYE parties is going down at Avant-Garde Bar and will feature a nice lineup of live music. $5 will get you in and you’ll get to enjoy performances by Ottawa post rockers Lost Acres and friends. 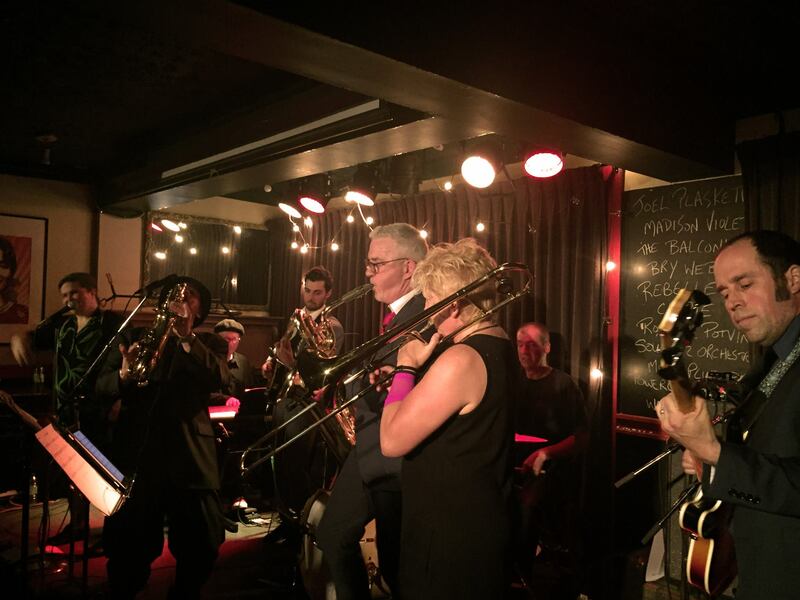 Year after year, Wakefield’s legendary Blacksheep Inn puts on a festive NYE party that tends to sell out. To ring in 2018, the popular venue has dubbed the event Waked Up! and promises a night of funk and soul grooves with DJ BeatScience. If you want to spend December 31st dancing the night away to the sounds of Ottawa/Hull/Wakefield experimental funk band Hilotrons, Irene’s Pub is where you’ll want to be. It’s always a good time with Hilotrons!